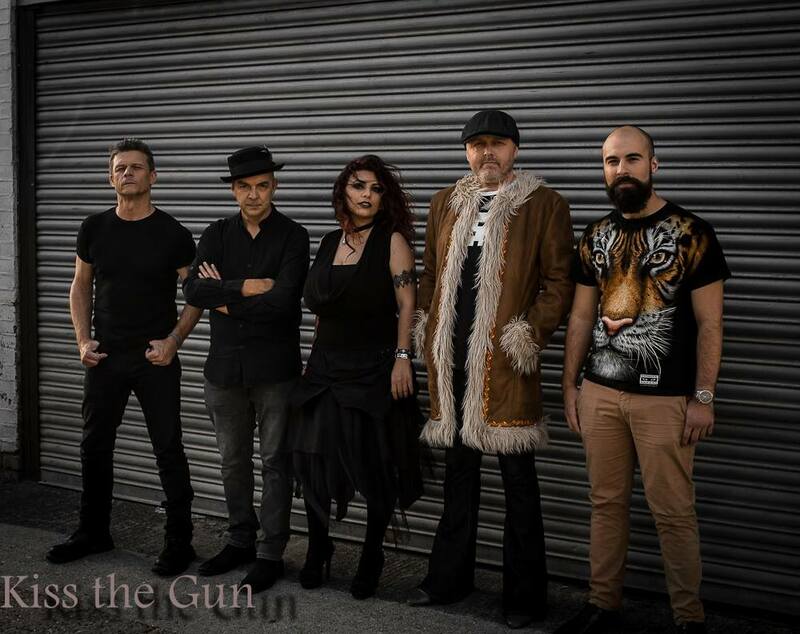 Band bio: KISS THE GUN was born at Dave’s place in Salisbury in January 2016, Dave and Graham wrote a song called Tainted Heart and in a couple of hours had a demo that was uploaded to Soundcloud. That demo got heard by Malcolm Scott one of the Directors at 3Ms who asked us to record an EP; the band was born and recorded at Smokehouse Studios in London in April 2016. The new line-up was announced in April 2017, after writing (predominantly by Dave South) and rehearsing the band recorded again at Smokehouse Studios in August 2017 and the debut album “Nightmares” is due to be released on 24 October 2017. Vocals – Nadin Zakharian: At the age of 12 started practicing vocals and fundamentals of music theory. In 2011 Nadin was a semi-finalist of Georgian TV project “Talented” and then in 2013 was a semi-finalist in the reality TV singing competition “the Voice of Georgia”. Her “System of a down” cover versions on YouTube have over 1.5m views & generated multiple international collaboration opportunities. Bass Guitar – Dave South: Dave started out aged 11 originally playing drums but swapped drums for a bass guitar when he joined his first serious band playing on the original NWOBHM circuit. In the 90s Dave changed direction, writing dance, club music and was signed to a record label, writing and recording in top studios around London. Dave then joined a number of local bands in Salisbury playing a mixture of covers and original material. Drums (and trombone) – Rob Taylor: Rob has been playing drums for about 11 years. He recently moved back home after a 2 year stint playing trombone on cruise ships and is currently working as a semi-professional musician around the south of England. He finished his degree in classical music performance on tenor trombone at Trinity College of Music in 2014, so of course the natural progression was to join a rock band on drums! Lead Guitar – Gerry Hearn: Gerry started learning to play aged 14 and was gigging just after his 15th birthday. He’s toured throughout Europe with bands ranging from ‘Uriah Heep’ to Freddie Starr as well as bands such as ‘Unforgiven Kingdom’, ‘Lynchpin’, and others including a Gary Moore tribute band. He’s also had a highly successful teaching career, his clients going on to play on the pub/club circuit but also on the worldwide stage, performing with artists such as Jessie J and Pixie Lott.